Just in time for the Holidays, Josh and Emily get into the spirit and decorate the bar. But what would a bar be without patrons, and this time, they are joined by The Diad and Wicked Sephiroth to help consolidate the cheer with their own track selections and memories. But, you probably have some questions, such as: How did they get here? Where is the Devil's Course? What is up with that spooky Christmas tree? Is this song speeding up? 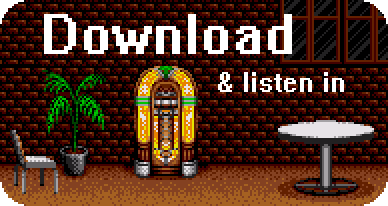 Find out the answers to all this and more on this very special VGM Jukebox reunion episode! Answer Key: A combination of necromancy and Christmas magic, somewhere between hell and heaven, see question one, and no it's not. In the wake of last week's festivities, Emily and Josh somehow find themselves back in the Spa Zone. That's right, it's one of those super chill credit levels where you can feel free to wander around, lay on the floor with the lights out, or whatever. So join them for one last hurrah (at least before the Christmas get together) as they watch Haju get a manicure, a Mech getting a massage, damsel flies in high resolution, and as they share all those feelings that have been a part of this beautiful show that you made possible. Stay tuned for the graduation ceremony for ALL of their recommending patrons and be reminded how much you mean to them, and always will. P.S. Let us know which vehicle and dance partner you chose in the comment section below! Well everyone, it's the second-to-last episode of The VGM Jukebox. To be on the brink of such an ending is bittersweet, but that doesn't mean we're not gonna party it up tonight! After Josh and Emily get their extra-dimensional situation sorted out, listen in on a band of fellow patrons who've come together in the overworld and created a loving tribute to the entire VGMJB community. But that's not all: Josh and Emily are also keeping the bar open after hours for the Penultimate Podcast Patron Party, where even more surprises, laughs, karaokes, and stellar tunes will be had. To say this episode is brimming with magical moments doesn't even begin to cover it. Our story is happy ending, so let's celebrate ourselves and the cosmic connections between us all. You won't want to miss it! EXTRA CREDIT: The Mad Gear's cover of Sonic Spinball's "Toxic Caves"
Earlier this year Emily was in the throes of a particular difficult migraine situation when she put out a call to the VGM Jukebox community. "Please share some feel-good VGM medicine," she wrote -- and within minutes, the responses started pouring in. The deluge of musical affection did indeed have healing properties, and now Emily wants to reflect this potent magic back on you through the power of mixtapes. Whether you decide to save this dose for a difficult day or choose to rip open the packaging right away, here's hoping it works for you like it worked for her! And of course, thanks to all the patrons who sent their love in that thread: Jay, Spritz, Ed, Mike, Carlito, Daniel, Ben, Jordan, Ken, Calvin, Pernell, Alex, and John. Your kindness meant so much, and it always will.